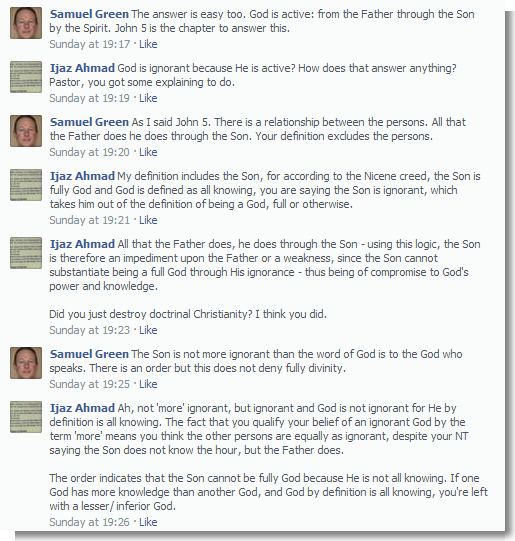 Samuel Green, an Australian preacher who is described by Shamoun as his favourite apologist/ Christianity’s best apologist has responded to a Facebook post of mines. 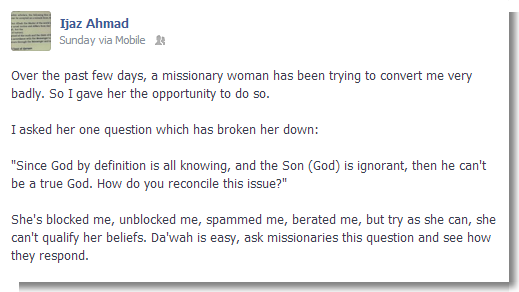 Unfortunately, I don’t think it went well for him, perhaps there are other Christians out there willing to help him? I did want to post this as a Missionary Mishap, but I think this post is a serious question and I don’t wish to denigrate the character of Mr. Green, of whom I enjoy discussing Christianity with. My question has yet to be answered and I fully believe that Samuel’s exacerbated the issue to a far greater extent that I imagined he would have. Any Christians willing to take the dive and jump into this debacle? You guys are churning out the same stuff over and over again these things have been dealt some times it is hardly worth responding. Can you answer it for me then? Thanks in advance.